Slip-and-falls, a leading cause of injury-related death, are a legitimate worry among the elderly. So common are these injuries that many seniors know first hand the effects of a fall — no doubt having seen friends their age, healthy and independent, immobilized and homebound due to a sudden and unforeseen fall. This is known as the fear of falling (FOF), and it can become a self-fulfilling prophecy. If the fear influences the senior to walk with a hesitant gait, causing instability, it will likely lead to the fall that was feared in the first place. FOF can also lead to a more sedentary lifestyle, fading the muscle tone and the ability to bear weight, and can cause long bones to lose mass and size as they are no longer being strengthened with weight bearing exercises. The fear is usually easy to see, and even if it is not, the effects are hard to ignore, especially for family members. A recent hospitalization is ending, and there is an apparent loss of strength and endurance. A loved one has been home for a while but is getting no exercise at all. Now essentially bed ridden, he or she may refuse to be more active, perhaps because of intermittent painful arthritis or other chronic issues. Either way, it might be beneficial to ask your primary care physician about a Physical Therapy (PT) and even Occupational Therapy (OT) evaluation. Also, plan to be at the evaluation. Even if services are denied, ask questions about other services that might be of benefit. I have seen times when PT is ordered but even the gentlest PT has been too painful for those with inflammatory flare ups. If this is your case be aware that your love one’s muscles can quickly atrophy. Look for other types of therapy in your area that you could suggest to your primary care physician to promote range of motion and strengthening. I have seen amazing results using therapeutic aquatics, because besides strengthening, it has multiple added benefits such as better range of motion, pain control, improved sleep patterns, and insomnia reduced by 90%. Bounce a balloon, or toss a nerf basketball, back and forth with a senior who is bed-bound. Elicit your senior’s help with turning and repositioning. I have used colored masking tape to show where seniors can best place their hands on opposite side rails when repositioning them. Make use of a desk top punching bag. Make a pull-up rope by unrolling gauze bandage, tie it to the center foot of the bed, and bring the reins front and center after securing them. Using this simple mechanism, the senior would be able to pull themselves forward as well as shift their weight or position. This is also helpful to prevent pressure skin breakdown. Make use of a desk top pedaling device which helps prevent atrophy of hands and feet as well as promote good blood flow to those weakened muscles. Finally, range of motion exercises should be done daily. Begin by monitoring the exercises with the senior, but as the exercises become more routine and understood, the family caregiver can start allowing the senior to do them more independently. When a senior is too weak to move independently, passive range of motion maintains joint mobility for future activity. Preventing muscular weakness and irreversible contractures can be that simple. 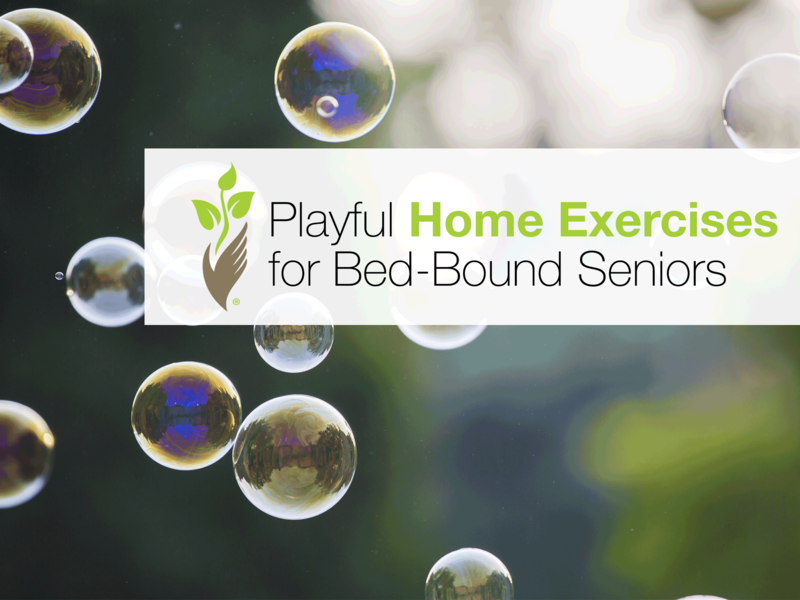 Incorporating simple exercises into your seniors activities is a fun way to combine therapeutic intervention with one-on-one playful caregiver interaction. This is the first step on the path to greater strength and endurance. Take time to review the proper method of providing range of motion exercises.